Well it looks like they aren’t going to shut down sockeye, or at least I haven’t seen any emails as of today. It’s late in the season and there are still some around, lots of jumpers down at South Arm, but there aren’t too many fresh fish left to show up. 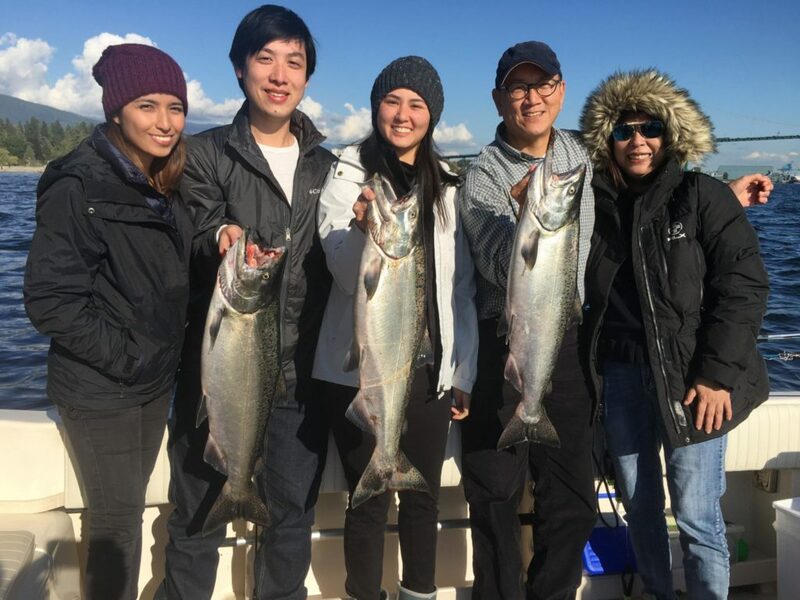 Eddie was down there on a longer trip on Wednesday and did well for sockeye and then headed to the Cap for chinook, so that is a good game plan if you have the weather and the right tides. Ian with a nice one that made it past the seals! The Cap Mouth chinook fishery is now in full swing and Lars, Eddie, Khoi, and Philippe all had some great catches there mid week on our 5-8 hour charters. Green and chartreuse blade glow flashers and green or chartreuse glow teaser heads with an anchovy or herring, fished close to the bottom, are producing well. This is a crowded fishery so don’t try and come down towards the green marker with the flood tide on your stern and take that inside lane. Stay wide on the way down, on the outside of the pack of boats, make your turn to port at the green marker, then troll into the flood current. If everyone fishes this way it creates a nice and organized oval circuit. Don’t be that guy trying to take the inside lane in both directions. General rule is starboard rod to the beach gets the right of way. Also keep an eye out for the cruise ships and the freighters. You will see the Port Authority out there making sure you aren’t past the green marker or out in the shipping lane. When you see the commercial vessels approaching troll further up towards Ambleside until they pass. If we don’t start doing this there is the potential for this area to be closed. I have been in meetings with the Port. They don’t want this fishery to close, they understand how unique it is, but they also have to make sure we are safe as are the commercial vessels, so lets help them out by proactive in out boat positioning while the freighters and cruise ships are approaching. Captain Eddie’s guests enjoyed some success on their Cap Mouth trips this week! A reminder that the limit is currently 1 chinook a day at the Cap. Remember to keep the heads of your hatchery fish (missing adipose fin) and return them to us at the shop (78 East Broadway, Vancouver) or a Head Depot near you. This is very important as this data will go a long ways in showing the success of the hatchery and net pen programs so we can go back to a 2 fish a day limit for chinook. These fish, by the time we get them at the Cap Mouth, are not orca food. They are stacked up at the Cap Mouth and provide a sport fishery and the hatchery managers want us to harvest these fish. They don’t use these fish for brood, they get the brood from the Chilliwack/Vedder. 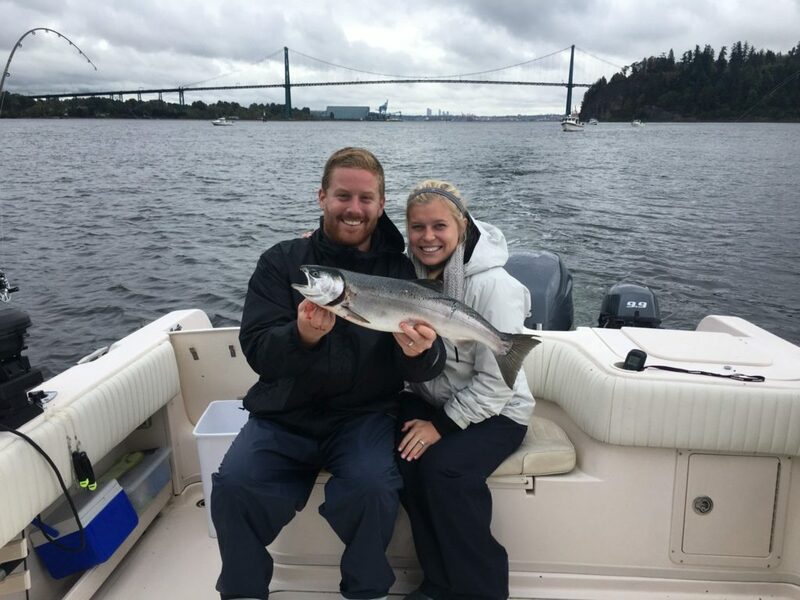 Despite the Capilano River coming up significantly with recent rains, there are still catchable numbers of coho off Stanley Park. I am not sure how much longer this will last, but if you get your springs off the Cap it can be worth checking this area out. They are starting to get lockjaw, but we have been able to get a few to the boat in recent trips.